From 1998 through 2013 I worked on various community based projects in Grand Rapids, MI. I approached this work from the Beuysian perspective of Social Sculpture. All of these projects were collaborations with community members, organizations and other vested parties. Working with neighbors we combined the efforts of several working groups focusing on Complete Streets, Green Infrastructure, Community Schools, and New Development. The Public Space Strategy grew out of months of community meetings and input from neighbors, outlining a long term vision for our neighborhood led by consultants from Lott3Metz Architecture. 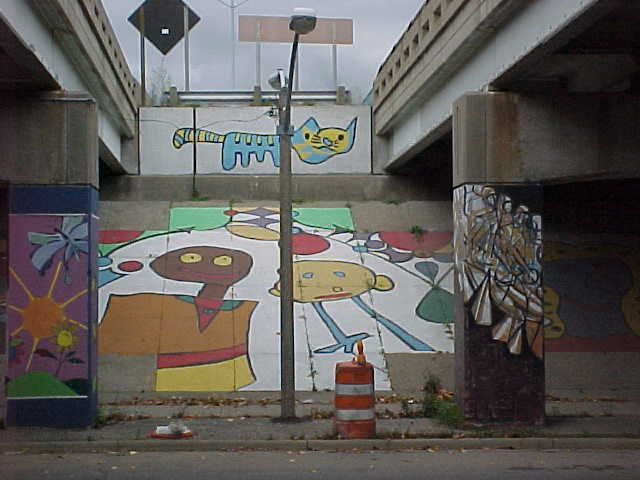 Originally focused on two central city neighborhood business districts with high vacancy rates, hundreds of local artists, and thousands of community members – the Free Radical mixed these elements to create temporary galleries and unique community events. Curators and artists were matched with building and business owners who had available space, the end result was a series of one night shows that drew thousands of community members to experience local art and to discover forgotten spaces. Current Free Radical events are being hosted by the Avenue for the Arts and info can be found HERE. Working with neighbors, we formed a partnership between Congress Elementary School, local businesses, and the East Hills Council of Neighbors. The focus was to make Congress the best it can be by building strong relationships between the students, staff, and community. The partnership has grown a community garden, improvements to the grounds, and planning for a future school expansion. Working with neighborhood folks, we developed a partnership between four area business districts and four neighborhood associations. The effort led to increased cooperation, area wide branding, and a State of Michigan Cool City designation. The effort grew legs and now is a fully formed Business & Corridor Improvement District. The urban forest is a vital part of a healthy city providing services such as storm-water mitigation, carbon sequestration, and heat-island effect reduction. In collaboration with fellow community activists we have developed pilot projects in the East Hills neighborhood of Grand Rapids, MI to address issues that threaten our urban forest. The East Hills Tree Project has included grant-writing, public education, GPS tree mapping, advocacy, and tree planting programs. The project has grown into a city wide effort under the management of Friends of Grand Rapids Parks. Wealthy Heights was an enclave of small, dilapidated houses on narrow, dead-end streets situated adjacent to what was otherwise successful re-investment and historic preservation efforts. The area had high vacancy, crime and absentee owner rates that prevented rejuvenation attempts to take root. Working with neighbors we developed partnerships to address key issues that face the area and how design might add to the success of the neighborhood. A new street plan was developed, connecting streets and changing traffic patterns to enhance connectivity. A partnership between local non-profit housing developers has increased opportunities for affordable home ownership while changing the face of 25% of the houses in the area. A community built mural project; a kid’s salsa garden and canning workshops; a joint science and art curriculum; and a photo mentorship program – a year of engagement projects in collaboration with the Belknap neighborhood in Grand Rapids, MI. Community engagement activities included public drawing sessions, cooking lessons, classroom work, exhibitions, gardening, and botany lessons.